I have resisted pasta for many years. Other people can’t get enough of it – I could take it or leave it. But life in our household has been pretty crazy lately, and I have been embracing pasta as a way to get dinner on the table relatively quickly instead of having to resort to eating crackers (It’s happened) so a quick pasta recipe seemed perfect. I think the problem is I’m not really a fan of traditional spaghetti sauce. My husband has taken to complaining that we never have a jar of spaghetti sauce in the house (he asked if we could make a bid for normalcy and just have a jar of Prego), while I’ve never felt the lack. Once I started to move away from the tomato sauces, pasta got a lot more interesting. This one was inspired by a gorgeous wheel of Irish Cashel Blue cheese that the kind folks at Kerrygold USA sent me. I’ve been a fan of their grass fed butter for years, but I won a year’s supply of butter and cheese at the Big Traveling Potluck and that has made be a convert to their amazing Irish cheeses. 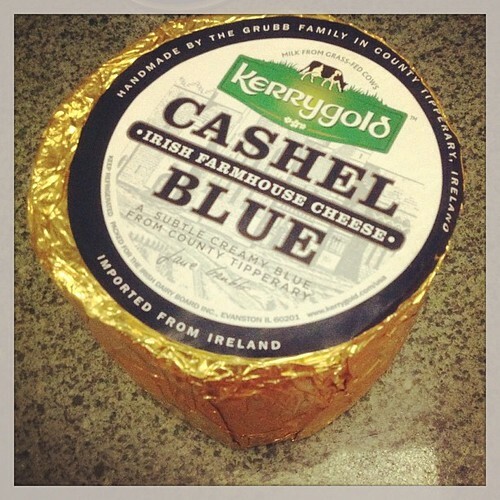 They have several cheddar and cheddar type cheeses that are amazing, but my favorite is probably the Cashel Blue. I shared the wheel with family members but immediately regretted it – I wanted more blue cheese for myself! Even my mom, who has been a diehard French Roquefort snob for years said this is her new favorite blue. I wanted a quick pasta recipe that was easy enough for a weeknight meal, but showcased some of the amazing flavors of the cheese. This one is adapted from a Nigel Slater recipe for pasta with a spinach and blue cheese sauce, and rounded out the flavor with some roasted butternut squash. The result is a dish that’s easy enough for a weeknight, but a far cry from a jar of Prego on pasta. And the husband had no complaints. Meanwhile, heat the pasta water and cook the pasta according to package directions. Rinse the spinach in water. In a saucepan with a lid, wilt the spinach. Add the cream, and blue cheese and cook over low heat until the cheese is melted. 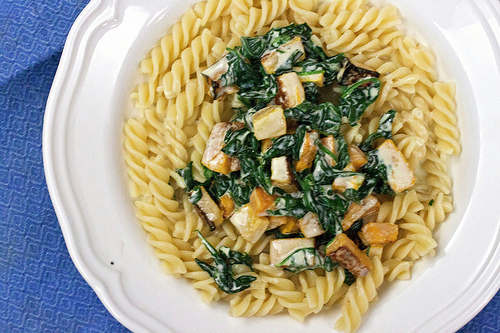 Toss the cooked pasta, spinach cheese sauce, and butternut squash. Serve immediately. It’s a great throw-together meal.